There are automatic email notifications notifying you about your actual credit balance. Balance notifications are sent to your primary email address and to your billing contacts when your balance reaches the following thresholds. Please read about grace limit. Please read about free trial. 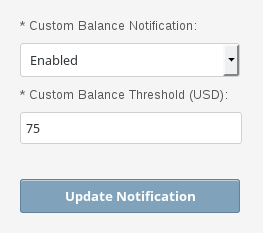 On the Billing/Settings page you can setup a custom email notification as in the picture below.